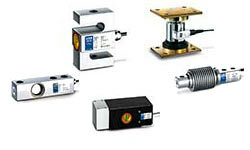 Load cells are ideal for designing weighing systems or weighing via scales. Load cells are special types of power acceptors, that are often more common than force absorbers (force sensors). They are unlike the force absorbers not calibrated in Newton but instead in gram, and kilogram or to ns. Load cells incorporate spring bellows, that are being deformed as soon as a weight is lied on it. The deformation for weights of 100 gram to 1000 tons is captured by an strain gauge, which immediately converts it into an electrical signal. Depending on spring bellows, load cells feature a varying range of dynamic characteristics. Higher dynamics are very important for several filling and assortment facilities, since for the actual weighing procedure there are often only fractional amounts of seconds available. Older load cells therefore use oil as damping, the newer systems use a combination of very stiff mechanical load cells and filters that are electronically adjusted to them and installed in a downstream measuring device. During static applications often only the design size and the type of load division (montage) are important, e.g. whether the load cells are to be harmonically integrated or of the design size of a container is not allowed to change etc. The weighing facilities are divided into those requiring calibration and those not requiring any calibration at all. The range of a necessary calibration covers e.g. all scales in areas of trading (meet, fruits and vegetables etc. ). Therefore their are laws that regulate the measuring and calibration constitution (see calibration) in the EU demanding certain requirements for scales and therefore the load cells and all connected electronics. Weighing cells that are designed for these areas of application must feature certain kinds of characteristics regarding their measuring deviations and repeatability. Don't hesitate to call us if you wish to enquire about our load cells. If you can't find the load cells you are looking for, please contact us and we will help you find the best solution which suits your needs: UK customers +44(0) 23 809 870 30 / US customers (561) 320-9162. Our technical staff will advise you regarding our products. Our engineers and technicians will be happy to help you with the axle load scales, and of course, with the other products in the field of regulation and control, and measuring instruments.